Sue Bernier, of Niagara Falls, was diagnosed in 1999 with ovarian cancer and had a re-occurrence in 2007, both instances requiring surgery and chemotherapy. During a vacation in June 2007 she attended a craft show in Texas and was captivated by some crocheted necklaces. Ideas began to form and she thought this was the perfect project to provide a distraction and to take her mind off cancer. Her original plan was to raise a few dollars for Wellspring Niagara, who was a great support system for her and her family. She decided to call these “Necklaces of Hope” which were an instant success and wo rd has spread so fast that Sue and her growing team of volunteer “hookers” have raised over $330,000 to date for Wellspring Niagara as well as an additional $30,000 for other cancer groups. What an accomplishment! 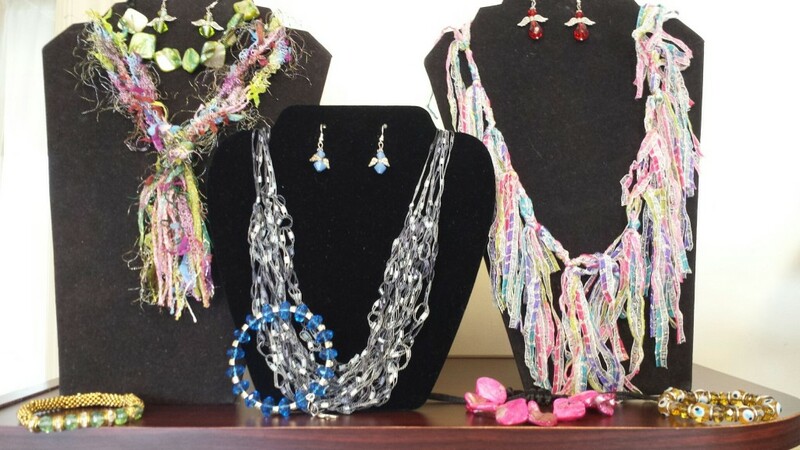 In addition to the beautiful Necklaces of Hope, Sue now offers Earrings of Hope, Bracelets of Hope, and more. In December 2010, Sue started the Necklaces of Hope Foundation. Tax deductable funds donated to this Foundation will be held in perpetuity, generating annual earnings to support Wellspring Niagara. Necklace Cost: $5.00 each WITH ALL proceeds support the programs offered free of charge at Wellspring Niagara.